The cabin, ports, dining and service delivered by Oceania were superb, providing us with a wonderful 12 day cruise that created the trip of a lifetime. We are experienced and frequent overseas travellers, but had always been hesitant about the cruise experience, due to concerns about the quality of meals, and the "tour bus" experience. But from the moment you walk on to Riviera and see the grant staircase you know you are in the lap of luxury. 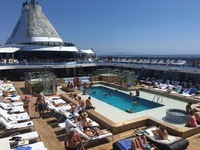 Every aspect of the ship delivered a fantastic attention to detail and class from the bars and restaurants, to the corridors, cabins and afternoon tea in Horizons, and the staff waiting with water as you disembark, then cold towels and lemonade when you return. The cabin was much bigger than we expected and very well appointed. Service here was superb. We returned from breakfast to find beds made and cabins tidied, and from dinner to find the room ready for sleep with notices on the next days tours. Cleaning and attention to detail here was superb and room service super quick - about 7 minutes to deliver a pot of tea, 15 for a meal. Meals were good, some very good, though they did not meet expectations for the claim to be the "finest dining any sea". Red Ginger in particular was a disappointment as it tried, unsuccessfully, to cover all Asian cuisine, though the service was impeccable. Polo Grill was an average steak house, albeit in a magnificent setting and Toscana was standard Italian food. Only Jacques offered something special, but even here this was not the greatest meal we&apos;d ever had. The best meal, by far was the La reserve wine dinner - unlike the others this comes at additional cost but it was worth it, some very good wines, great food and a very special night. However the regular restaurants exceeded expectations, especially Terrace Cafe with its freshly grilled seafood, fresh sushi and salads, and a setting that, especially at breakfast, delivered a meal under the sun framed against a port backdrop.The Grand Dining Room also delivered a very good experience the times we ate there - magnificent service and very good meals. The highlight was the daily afternoon tea in Horizons, a very classy affair with waiters in white gloves bringing around pastries and tea while the string quarter played. Our one complaint would be about the lack of fresh milk, which somewhat dimmed the overall experience. Note to cruise ship operators UHT milk is revolting and NEVER a substitute. Baristas was a welcome chance to have a decent coffee, but again, ruined by UHT milk in the latte. Wine prices are absurd, astronomical prices for some very average wines. One comparison - a very ordinary Australian red which retails for about $US10 in Australia was being offered for $US70 after the compulsory gratuity. Only those wines exceeding the $US100 price point seemed to be especially good. You can bring your own, but there is a $25 charge (which is actually worth it, given their prices). However, there is maximum of 3 bottles per cruise. We did not take part in any of the entertainment, which seemed underwhelming, and while we appreciated the string quartet, they were clearly not very good. However we signed up to the two wine tastings. Little pricey but overall a good chance to taste some different wines and learn a little about them. There is just one pool, which at times becomes very crowded, but seems to do the job with waiters constantly delivering drinks and food and freshening up towels. The gym is quite small, but seems to cope with the demand. Onboard laundries were handy, though the 25 minute cycle on the machine was hopeless at getting stains out. Washing machine and dryers operated on token purchased with $US bills from machines or purchased at reception. A very good way of keeping clothes clean and costs down. Shore excursions are absurdly priced at around $US120 for a basic 4 hour bus tour - that said the two we took, to Diros Caves and on Santorini were very good, with great guides and a superb experience. The ports chosen were mostly brilliant - Venice, Dubrovnik, Kotor, Santorini, Rhodes, Patmos and Athens were all wonderful. Gytheion surprised with the wonderful Diros Caves tour, though Ancona was a waste of time. Koper itself was underwhelming but was a great jump off point for Lake Bled and Ljubljana. Our few complaints would be that our cabin was flooded one night. These things happen but communication was very bad, and we had to find this out ourselves, and force the ship to take action when we returned to our room to discover a blower going full blast on a soaking floor. They could not move us as the ship was full, but eventually came good with quick action to dry the floor, and a $400 shipboard credit. As mentioned meals were very good, though not as good as promoted and the lack of fresh milk was a disappointment (we bought our own in port and kept it in the fridge and then smuggled it to restaurants for when we had tea). Wifi was appalling - very slow and dropping out repeatedly, often for hours. However, that may well be the standard experience of wifi at sea. We still appreciated the fact it came free, and we could keep in touch through email and Facebook, so, it did the job. Overall this was a magnificent cruise - wonderful service, good food, great ports and a superb cabin. We&apos;ll be back. Oceania Riviera Horizons Afternoon Tea. The cabin, ports, dining and service delivered by Oceania were superb, providing us with a wonderful 12 day cruise that created the trip of a lifetime. We are experienced and frequent overseas travellers, but had always been hesitant about the cruise experience, due to concerns about the quality of meals, and the "tour bus" experience. 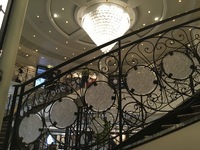 But from the moment you walk on to Riviera and see the grant staircase you know you are in the lap of luxury. 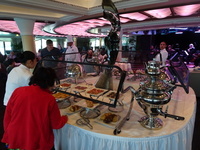 Every aspect of the ship delivered a fantastic attention to detail and class from the bars and restaurants, to the corridors, cabins and afternoon tea in Horizons, and the staff waiting with water as you disembark, then cold towels and lemonade when you return. The cabin was much bigger than we expected and very well appointed. Service here was superb. We returned from breakfast to find beds made and cabins tidied, and from dinner to find the room ready for sleep with notices on the next days tours. Cleaning and attention to detail here was superb and room service super quick - about 7 minutes to deliver a pot of tea, 15 for a meal. Meals were good, some very good, though they did not meet expectations for the claim to be the "finest dining any sea". Red Ginger in particular was a disappointment as it tried, unsuccessfully, to cover all Asian cuisine, though the service was impeccable. Polo Grill was an average steak house, albeit in a magnificent setting and Toscana was standard Italian food. Only Jacques offered something special, but even here this was not the greatest meal we&apos;d ever had. The best meal, by far was the La reserve wine dinner - unlike the others this comes at additional cost but it was worth it, some very good wines, great food and a very special night. However the regular restaurants exceeded expectations, especially Terrace Cafe with its freshly grilled seafood, fresh sushi and salads, and a setting that, especially at breakfast, delivered a meal under the sun framed against a port backdrop.The Grand Dining Room also delivered a very good experience the times we ate there - magnificent service and very good meals. The highlight was the daily afternoon tea in Horizons, a very classy affair with waiters in white gloves bringing around pastries and tea while the string quarter played. Our one complaint would be about the lack of fresh milk, which somewhat dimmed the overall experience. Note to cruise ship operators UHT milk is revolting and NEVER a substitute. Baristas was a welcome chance to have a decent coffee, but again, ruined by UHT milk in the latte. Wine prices are absurd, astronomical prices for some very average wines. One comparison - a very ordinary Australian red which retails for about $US10 in Australia was being offered for $US70 after the compulsory gratuity. Only those wines exceeding the $US100 price point seemed to be especially good. You can bring your own, but there is a $25 charge (which is actually worth it, given their prices). However, there is maximum of 3 bottles per cruise. We did not take part in any of the entertainment, which seemed underwhelming, and while we appreciated the string quartet, they were clearly not very good. However we signed up to the two wine tastings. Little pricey but overall a good chance to taste some different wines and learn a little about them. There is just one pool, which at times becomes very crowded, but seems to do the job with waiters constantly delivering drinks and food and freshening up towels. The gym is quite small, but seems to cope with the demand. Onboard laundries were handy, though the 25 minute cycle on the machine was hopeless at getting stains out. Washing machine and dryers operated on token purchased with $US bills from machines or purchased at reception. A very good way of keeping clothes clean and costs down. Shore excursions are absurdly priced at around $US120 for a basic 4 hour bus tour - that said the two we took, to Diros Caves and on Santorini were very good, with great guides and a superb experience. The ports chosen were mostly brilliant - Venice, Dubrovnik, Kotor, Santorini, Rhodes, Patmos and Athens were all wonderful. Gytheion surprised with the wonderful Diros Caves tour, though Ancona was a waste of time. Koper itself was underwhelming but was a great jump off point for Lake Bled and Ljubljana. Our few complaints would be that our cabin was flooded one night. These things happen but communication was very bad, and we had to find this out ourselves, and force the ship to take action when we returned to our room to discover a blower going full blast on a soaking floor. They could not move us as the ship was full, but eventually came good with quick action to dry the floor, and a $400 shipboard credit. As mentioned meals were very good, though not as good as promoted and the lack of fresh milk was a disappointment (we bought our own in port and kept it in the fridge and then smuggled it to restaurants for when we had tea). Wifi was appalling - very slow and dropping out repeatedly, often for hours. However, that may well be the standard experience of wifi at sea. We still appreciated the fact it came free, and we could keep in touch through email and Facebook, so, it did the job. Overall this was a magnificent cruise - wonderful service, good food, great ports and a superb cabin. We&apos;ll be back. A great cabin and full marks to our Oceana Cruise consultant for suggesting it. It was right opposite the laundry, which made that a very simple task and was towards the front of the ship, which kept down engine noice and passing traffic. We rarely heard anything. This mean it was some distance from the dining room and pool (with are at the back) but we preferred the quieter location to the convenience. The cabin was much bigger than we expected and very well appointed. There was plenty of room to hang clothes, and suitcases slid easily out of way under the bed. There is a couch, a desk, and a TV showing some very good movies. The bed was fantastic, a great night&apos;s sleep, so good, they even offer to sell you the ned. Bathroom was a decent size with a tiny, but stand alone shower, as well as a bath and shower. Beautifully appointed and a real surprise. Balcony was small, but big enough to sit out on, watch the world go by and read or have a drink. Room service was superb. We returned from breakfast to find beds made and cabins tidied, and from dinner to find the room ready for sleep with notices on the next days tours. Cleaning and attention to detail here was top rate and room service super quick - about 7 minutes to deliver a pot of tea, 15 for a meal. Not much to see here. This is mainly a ferry port, and the ship only seems to stop here as an entry to the 2 hour trip to San Marino. We asked around the town, saw the church and Duomo and stopped for a drink. A pleasant few hours but not recommended. Spiros was waiting for as as we left the ship, and from start to finish deliver an exceptional tour. He took us to wonderfull looks outs, produced a fabulous feats of bread, tomatoes, wine and olive oil, great commentary, and a passion for his island and his job that left w wonderful impressions. He constantly offered suggestions, ideas and was happy to to go wherever we suggested. The highlight was Paleokastrttsa and especially its wonderful monastery. A superb day out. Stunning, but very hot and very crowded. Game of Thrones has made this the must see visit, and crowds here were insane. But the walk, and view from the city walls was magnificent (albeit, with 700 steps on a baking hot day and no shade), and you could lose the crowds by diverting off into small side alleys. The cable car was a great view, though terrible service. We also took a 1 hour boat ride along the wall and out to sea to see the city from the other side. A magnificent stop, and just a short, free bus ride from the port. A real surprise. While there is little to see and do in Gythion, the shore excursion was a wonderful day out. The underground cave tour by boat was stunning, and even the drive there offered some lovely views and Helen&apos;s lively and brilliant commentary. Magnificent. A stunning blue lake amid mountain scenery, with a church on an island and castle hanging from a cliff top. Just gorgeous - a must do on any trip to Slovenia. An interesting old town, and worth the visit from the ship, if only to escape the very boring port. Lots of great cafes, churches and shops, and in a small compact space. An absolute gems and without the crowds of Dubrovnik. A stunning arrival down a long fjord, and the ship either docks alongside the old city, or is a short tender ride away. The small old city was wonderful to walk around, and without the prices or crowds or overtly touristy feel of Dubrovnik. The hop on hop off bus was a great bargain - it took us to Perast to see the Roman ruins, and to the boat for the short ride out to the church in the middle of the bay. A wonderful surprise. Another wonderful surprise. There seemed little point to this visit until we arrived, but what a gem it turned out to be. Taxis were waiting at the port, hustling for fares, and for a very decent price our driver delivered us first to the cave of St John, then the town and monastery higher up the hill and finally back to port for a swim and meal on the beach. This was pretty much all there was to do here, but it made the perfect day trip ashore. Another stunning surprise. From the ship there is literally a 5 minute walk to the city walls, and then you find yourself within this labyrinth of winding streets, wonderful shopping and incredible history. Again, a place we knew little about before we came, but a wonderful day out. And the easiest of the lot do solo - walk off ship, and you&apos;re in the town. Wonderful. It&apos;s hard to see how any tour here could fail, given the stunning scenery, but this was still well done. A drive first to the mountain lookout which gave great perspective of the island, then off to Oia for the classic shots, and final back to Fira. It probably would have been cheaper to do this solo with a bus or local operator, but the bonus of being delivered early, and direct to the bus made this worthwhile. An amazing island, with great views, fabulous food and amazing sights. Venice, simply magnificent. From the ship to San Marco requires a little effort, either a 20 minute walk to Piazzale Roma and a Vaporetto down the Grand Canal, or there is a Ferry near the ship. Get going early as that vaporetto at Piazzale Roma is insanely busy by 10. But once you overcome this small hurdle you are among the world&apos;s most beautiful city. Our tip - get away from San Marco and the crowds as soon as possible. Pick a random church, gelato shop or cafe somewhere in the middle, and head there. At ever turn you will be delighted by canals, houses, shops and churches, or a random plaza. A spellbinding place that is far far better than anything you ever dreamed of.